The NY New Wave Synth combo began life on RCA records in 1980. For one reason or another, it didn’t happen. It may have been as simple a reason as I never saw them in the bins past 1984 or so. The first album, maybe never. About five years ago, Wounded Bird Records released both albums on CD but like all Wounded Bird discs I desire, failure to immediately buy them results in an OOP disc out of my budget. Sigh. 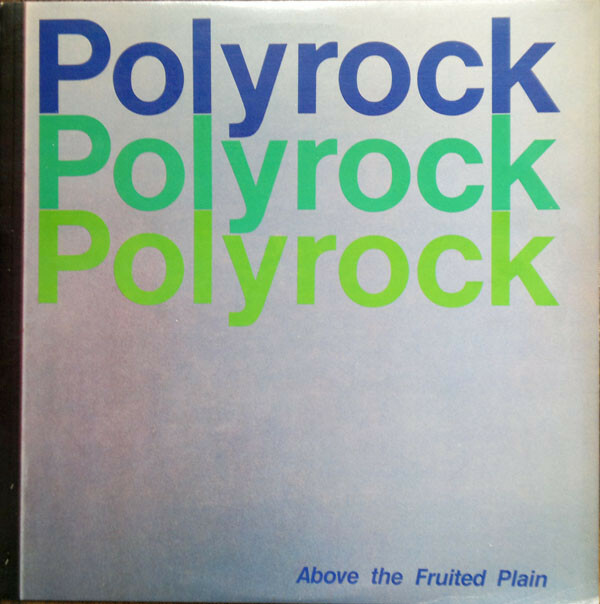 So I lacked any and all Polyrock music, until the 4th of July, when I happened across their 1982 EP [and final recording] “Above The Fruited Plain.” I remember it being released on PVC back in the day and it got a good review in Trouser Press, but after 1984 I can’t recall seeing one of these either. By that time Philip Glass no longer had RCA cash to rope him in, so this one was produced by Billy Robertson of the band. “Working On My Love” was a lilting, easy groove to appreciate. The Polyrock lineup was interesting for having three keyboardists, a guitarist and drummer but no permanent bass player. So the music was very melodic with a clarity and simple sophistication that represented the last flowering of New Wave as I knew it. Before the changes were wrought that transitioned it to “New Music” in 1983. The next track, “Call Of The Wild,” swapped Billy Robertson for Catherine Oblasney on lead vocals. The further changes were a more frenzied, DEVO-like sound and tempo. But the Akron spuds would never have a clavinet on their records as evidenced here. The song had plenty of room for space and riffage that let it sprawl slightly with some bass solos and heightened synth hooks before tightening back up for the song’s coda where Ms. Oblasney returned to revisit the the chorus. I wish I had heard this in 1982, as women fronting technopop were still a relatively rare phenomenon. From the tracks I heard on “Blitz,” I had no idea that Polyrock had a female vocalist, and one who recalled Martha Johnson of Martha + The Muffins was always a welcome thing. “Chains Of Iron” had a lovely guitar skank rhythm propelling the tune while featuring pianos carrying the melody. The guitar leads of Robertson had an almost New Order touch to them in terms of melody, if not sound. To hear music like this is to return to the heady days of 1982 when we thought the road still stretched ahead of us endlessly. We couldn’t know that hair metal and worse lay just around the corner. The tension of “Call Of The Wild” returned for the fast-paced Krautrock of “Broken China.” Then the EP showed its had with the left-field atypical instro-drone of “Indian Song.” The wordless vocals of Ms. Oblasney imparted a minor key almost psychedelic feel over the languidly paced music bed. The droning, repetitive organ riffs touched upon the Velvets, but the vibe here was an intriguing, proto-chillout soft of thing as done on real instruments. And that touches upon another delight of hearing this record now. This was the last hurrah for the pre-MIDI world of “dinosaur synth bands” as Berlin used to refer to themselves back in the day. The arrangements have a lot of spaciousness to them in spite of three keyboardists being in the band. The music sounds as if it could have been recorded live as in spite of three keyboardists, there is plenty of room for guitars and acoustic drums to play. This, in short, was music grounded in the late-70s period most near and dear to my heart. After this EP, Polyrock split up. Had they kept at it, their next records would have sported digital synths and drum machines and the results may have been much less idiosyncratic that the fine music on offer here. This entry was posted in Record Review and tagged 1982, EP, Polyrock. Bookmark the permalink. 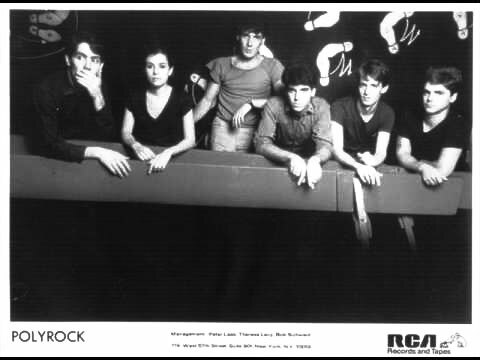 Firmly on the Art side of New Wave, Polyrock made few wrong moves to these ears. As much as I enjoy the first two albums and their Krautrock and naive-yet complex electronic sounds, the EP has everything I was looking for from Art Technopop. Indian Song is an amazing song to sign off with as a band and one that would have likely been very hard to surpass. Interesting review, looks like I need to check this out. Tangled Up In Music – It does offer pleasures not easily found out of its time period. The instrumental, as Echorich rightly pointed out, was very forward thinking. It didn’t remind me of anything else from its time period.